What is party without music? If you ask me, you can never throw down a great party without a proper music. And not just that, music can be used not only in parties and gatherings but also in regular, every day situations. For example, it is much more fun to cook while listening to music rather than cooking alone in a quiet kitchen. Also, in some situations there simply isn’t a possibility to use a music center, because there isn’t any source or power near by, such as in outdoor gatherings in the park or beach. All these situation can be solved with one simple, yet powerful device called docking station. Just below we have gathered a list of TOP 5 places where you can use an android music dock. Party. We all have been to a party where these is no music and half of the time we simply sit in an awkward silence. Well, if you had a music dock at that party, nothing like this would happen. One of the best features of new generation music docks is that not only one but multiple smartphones and other smart devices can connect to the music dock, so each person can put on their favourite songs. For example, you have a great playlist in your smartphone or on your Spotify account that you want to show everyone at the party, but your smartphone’s speakers simply aren’t powerful enough for the party. This is a common situation where music docks can be very handy. Living room. One of the most common place where android docking stations are used is living room. We tend to spend most of the time (at least while not sleeping) in the living room. Living room is a great place not only to relax but also to throw down a party, so prepare different playlists in your smartphone or tablet for each situation. Bedroom. The second most common place in the house where you would probably place a docking station is the bedroom. This is the case where android alarm clock docks are the most useful, as they have a built in alarm clock and radio functions. 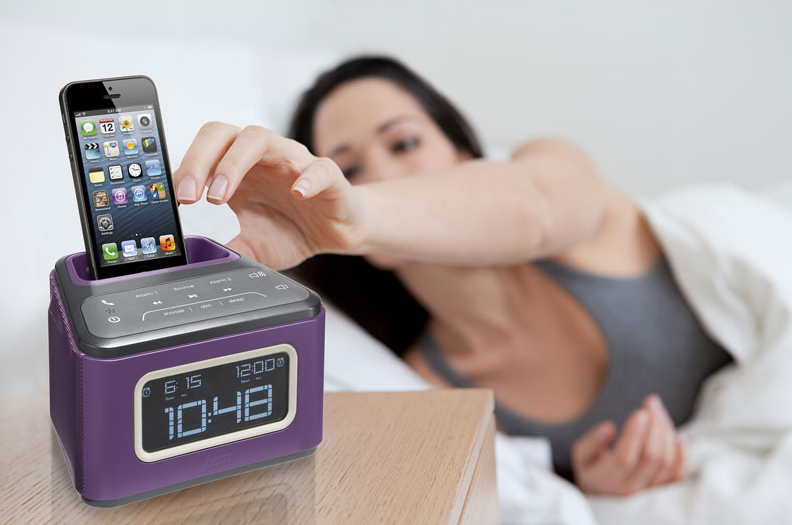 You can either wake up to your favourite songs from your smartphone or you can set the alarm clock dock to play a radio station of your choice in the morning. Outdoors. One place where bluetooth speakers and portable android music docs shine the most are outdoor areas. The best place to spend your free time is definitely outdoors. Imagine, how cool it would be to listen to your favourite songs on powerful speakers while having a grill party outdoors, relaxing by the pool or catching sun light in the beach? Kitchen. Cooking can be a long and exhausting process, especially if you have to cook alone. This is the reason why many people listen to music or radio while cooking which makes the time fly a lot faster. A music dock in kitchen is also a great gift for those that love to cook and spend most of their time in the kitchen, as they can not only listen to music but also put on a good audio book while cooking.